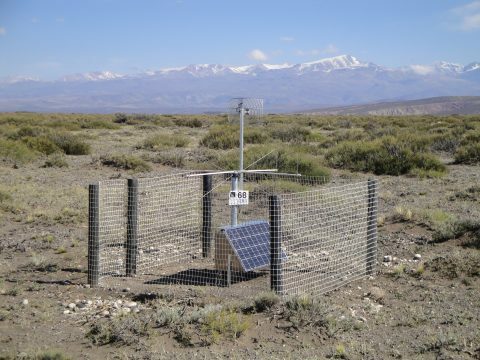 With a surface area of 3000 km2, the Pierre Auger Observatory, situated in the Argentinian Pampa Amarilla, is the world's largest detector for cosmic radiation. When ultrahigh-energy cosmic radiation approaches the earth, it collides with atmospheric particles. This results in new particles, which in turn collide and create more particles. The outcome is a particle avalanche that reaches the surface of the earth. Such an avalanche can cover an area of many square kilometres. The basic observatory observes radiation with energies of 1018 electron volts or more. These observations are made by 1660 Cherenkov detectors that measure the particles as they reach the surface of the earth. In addition, 24 telescopes observe the fluorescent light that is emitted by the particle avalanche. The observatory was later expanded with more Cherenkov detectors and three additional fluorescence telescopes. With these the detection threshold for part of the observatory has been brought down to 1017 electron volts. The observatory works superbly. The results published in 2013 show that despite our increasing knowledge of high-energy cosmic radiation much uncertainty remains about the origin and composition of the radiation. Researchers therefore want to measure its composition. For example, are these particles protons or heavier atomic nuclei? Besides analysing data from the basic observatory, researchers from Nikhef, the University of Groningen and Radboud University Nijmegen are mainly working on a new observation technique. They measure the radio waves emitted by the avalanche. In 2013 the experimental setup of this detector, the Auger Engineering Radio Array (AERA), was expanded from 24 to 124 radio detection stations, with improved mechanics and electronics. These stations can supply their own energy and communicate wirelessly with the outside world. The researchers have analysed the data from the 24 original AERA stations and for the first time they have demonstrated that it is possible to measure the composition of the incident cosmic particles . Another breakthrough was realised with the help of the LOFAR telescope. At the heart of LOFAR in Drenthe a large number of radio detectors have been set up. Using these detectors the researchers also demonstrated that the spatial distribution of the radio signal allows deducing the composition of the cosmic particles. AERA-2 autonomous radio detector station. The butterfly-shaped antenna is visible above the numbered identification plate. The system is powered entirely from the solar energy captured by the solar panel towards the bottom of the pole. The electronics are located behind the solar panel. An antenna for wireless communication is located on top of the pole.